For the love of liquorice-like things. For as long as I can remember I have loved liquorice. The aniseed jellies covered in blue sprinkles are the first thing I look for in a bag of liquorice allsorts, and I rarely refuse a chocolate bullet chocolate bullets. Chocolate covered aniseed rings are good too, and I thoroughly enjoy eating liquorice allsorts layer by layer. But those metre long straps? Nah, not for me. When I go home there’s often a bag of liquorice allsorts in the cupboard, and it doesn’t surprise me if there are some in the glove box of mum’s car. I pop by my grandparents and they have two jars. You see, they don’t like the plain liquorice pieces (probably because they buy homebrand) so they separate them and keep them in the jar for my brother when he comes home. Then there was my late grandmother’s jar, which was always accompanied by a “Get out of my liquorice allsorts!”. Hers were generally hit or miss. They were either really really old (because she barely ever ate them),or brand new. I give credit to my mother for that; it’s very likely she broke her teeth on the old ones a few days prior and promptly replaced them with a bag from Grandma’s supply. So you see, liquorice is a bit of a thing in my family. But liquorice falls into that bottom right hand corner of the Australian Guide to Healthy Eating. That only sometimes and in small amounts section. So that’s a bugger for my taste buds. However I have found some new liquorice-like staples for my kitchen. For those of you that are not aware, liquorice is a plant grown throughout Asia and the Mediterranean. Many people use the root of the plant to soothe sore throats, bronchitis, coughs, infections and digestive discomforts such as stomach ulcers and heart burn. It is also thought to reduce swelling and thin mucous secretions. Although there is little evidence to support this. I have particularly become fond of liquorice root tea. I find it’s really good mid-afternoon or after dinner when I’m craving something sweet. I also find it helps with tummy troubles also. There are a number of brands available in the supermarket, both in the standard tea aisle and the health food section. And then in April I found a way of having the flavour in my salads. Yes, It’s possible. Fennel is a different plant but it tastes sort of like liquorice. The seeds are dried and used in the kitchen or for medicinal purposes, with the stalks and bulbs being eaten raw or cooked. I came across fennel on my community placement when I was really lucky to be a part of a school holiday nutrition education program for newly arrived Refugee and Asylum seeker families. One of the activities was to educate them on how to prepare vegetables in a quick and healthy way. As I taught three children under 8 years old to make rice paper rolls (my respect for teachers only went up that day), my placement partner made a salad with another group of children. It was a salad of red cabbage, carrot, apple, sultanas, olive oil and fennel, and my goodness I loved it. Since then, the plant has become a regular on my shopping list. But I will admit that it hasn’t progressed any further in my kitchen than a salad. I have never used the stalks and I hate wasting them so I would welcome your suggestions on how to use these. So because it’s Friday and I love fennel, I’m going to share with you my quick and easy salad that features almost everyday a lunch, and goes really well with chicken. Use my measurements as a guide and alter to suit the number of mouths you want to feed. Finely slice cabbage, kale & fennel. Cut apple & carrot into matchsticks. Combine in large bowl. 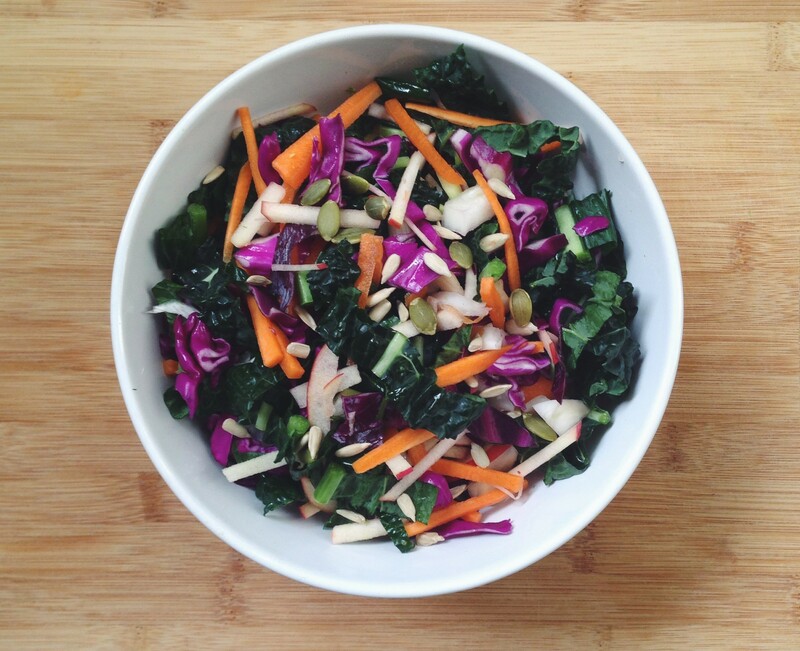 Combine dressing ingredients in separate bowl and pour over salad. I would love to see and hear if you try this salad. Feel free to email me, tag @emmajstubbs or share it on my facebook page. So, please tell me. 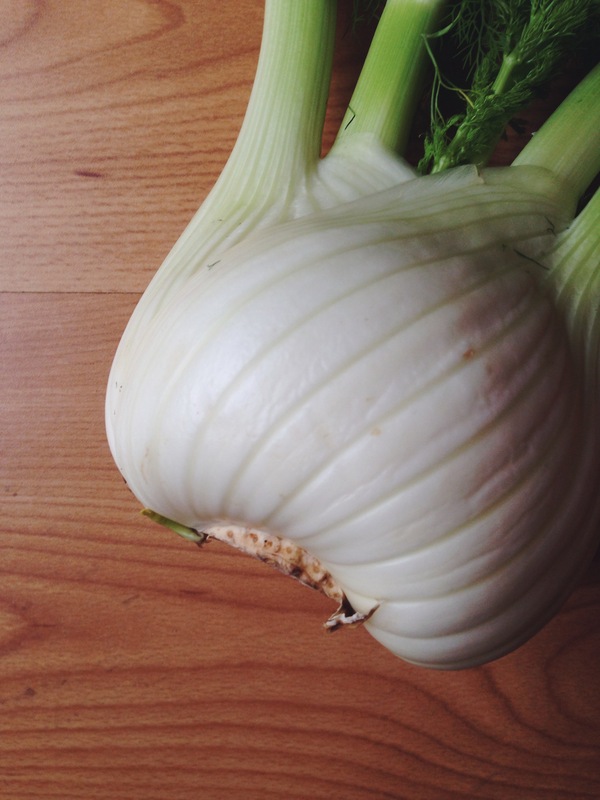 How do you use fennel? < Dietitian? But I don’t need to go on a diet. I eat it raw. If you find raw broccoli a bit bitter, I suggest maybe steaming or blanching it. I chuck it in my stir-fries all the time & it works well! Emma, just read what I typed. Meant liquorice not loco rice though I like too!